Indications: Allergy medication taken to reduce a histamine reaction. Summary Recommendations: Allegra is an over-the-counter allergy medication once available only by prescription. The medication is commonly used as a preventative treatment for seasonal allergies, but may be suggested to some patients for off-label treatment of other medical conditions. Allegra falls into the pregnancy category C, which means risk to pregnant women and the fetus has not been ruled out. If you are taking Allegra and you test positive for pregnancy, contact your allergist or obstetrician immediately for advice on how to proceed with your allergy treatment. General Precautions: Allegra is generally considered safe, but there are some medications, medical conditions and precautions patients need to consider before taking Allegra. Patients with a history of drug allergies should talk with a physician or pharmacist before starting Allegra. It is also important to tell your physician about all drugs, both prescription and over-the-counter, you are currently taking as some drugs may interact with Allegra. Two drugs known to interact with Allegra are Nizoral (ketaconazole) and erythromycin. Allegra should never be taken with fruit juices, including apple, grapefruit and orange. If you have kidney disease, or any other medical condition, talk with your physician before taking Allegra. Effects While Trying to Conceive: Human studies on the effect of Allegra on fertility showed no negative impact at doses well above normal (more than 4,000 mg/kg). Effects on Pregnancy: Allegra has been placed in pregnancy category C by the Food and Drug Administration. There are no reports of pregnancy or fetal complications, but animal studies show decreased fetal weight gain and increased risk of death. The effect of Allegra, in animal studies, was dose-dependent; higher doses of Allegra lead to more pronounced side effects. Further study is needed to rule out potential danger in human pregnancies. 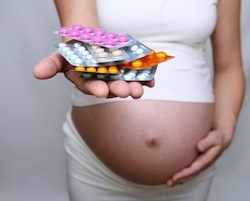 Allegra should only be used during pregnancy if the benefits of taking the drug outweigh potential risks. Safe During Breastfeeding: There are no reports of negative side effects in infants breastfed by mothers taking Allegra, however, no studies have been completed on the topic. A single phone study revealed three mothers who claimed Allegra caused irritability in offspring, but these reports have not been substantiated nor has a connection between Allegra and infant irritability been verified, in large-scale study. Some experts believe Allegra may have some effect on lactation. Antihistamines, in large doses, may affect milk production by decreasing serum prolactin levels. There have been no reports of reduced milk production in breastfeeding mothers taking Allegra.